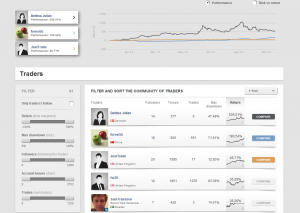 Launching in live beta today is Saxo Bank’s rebranded TradingFloor.com social trading platform. Saxo Bank’s entrance to social trading was initially covered in an interview with Co-Founder and Co-CEO, Kim Fournais, at last November’s Forex Magnates London Summit. At the time, Fournais stated that, “Social trading is here to stay,” and that the company believed it would be adding value to the space by making their diverse asset product base, which includes not just FX, but single shares, commodities and options available for the social trading network. For TradingFloor, the site has slowly evolved from an independent entity providing both proprietary and third party trading analysis, to getting greater integrated within the Saxo trader, to now becoming a social and web-based trading platform itself. Until its final live launch, Saxo’s social platform will be accessible at beta.tradingfloor.com. According to Saxo Bank, sharing of trading ideas will be only available to live traders; thus excluding performance from demo accounts. For non-Saxo Bank customers, the new TradingFloor.com will also have non-social trading features that are similar to items currently available, and include news, analysis, and market sentiment. In displaying TradingFloor.com to the public for the first time, Saxo Bank is presenting a launch conference today, which Forex Magnates will be covering. While Saxo Bank’s entrance to social trading with its own proprietary product provides confirmation that the sector is attracting the big boys, one of the questions we have is whether social trading will spawn a new class of asset managers. In a similar way to how the internet has brought us YouTube celebrities who have gone on to become well-known actors or launch successful online businesses, will the same occur in social trading? Will the next Peter Lynch and Bill Millers of the world be ‘discovered’ on social trading networks? These are some of the questions that Forex Magnates will be looking to answer and gain Saxo’s opinion later today.